Striking Competition 2016 – Hampreston Win Again! 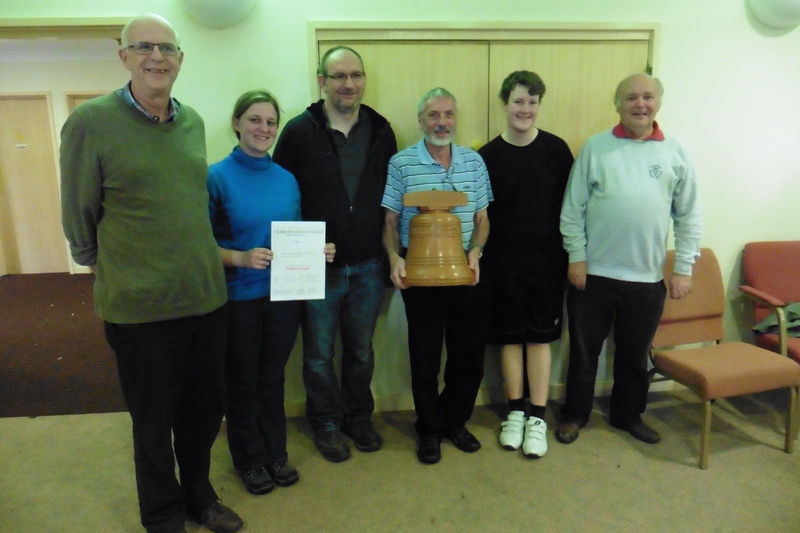 For the second time in three years, Hampreston were the proud winners of the East Dorset Branch Striking Competition, narrowly beating Wimborne into second place and the large wooden bell trophy is once again on display at the back of the church. The competition was held on a very wet May afternoon at Canford Magna with five teams from around the branch taking part. It was ably judged by Guild Master Robert Wellen and the new Salisbury Guild President, Judith Williamson who offered helpful comments to the teams taking part. The Canford ringers kept us well supplied with drinks before the cake competition cakes were eaten. There were also the poem competition entries to read, a quiz to attempt and a simulator to play with in the church. Our Hampreston call change team consisting of Ellie, Pauline, David, Richard, Harry and Angie (C) also put in a very creditable performance to come third in the Novice Shield competition. After a few problems early on, the band settled down and we managed some excellent ringing although much of it was after the first 100 rows when the judging had stopped! Both Hampreston and second-placed Wimborne will now go forward to take part in the 2016 SDGR 6 bell Striking Competition which will be held at Spetisbury in September. This entry was posted in Front Page News, News and tagged East Dorset branch, Striking Competition.